To enhance skills for employment in the automotive field in the areas of heating and cooling systems, servicing, EPA regulations, testing, and troubleshooting. 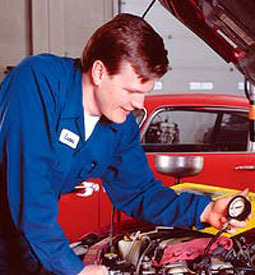 Today's automobiles and light trucks have sophisticated HVAC systems that need to be serviced regularly. Describe how an automotive heating, ventilation, and air-conditioning system works. Explain the air-conditioning refrigeration cycle and describe the operation of the expansion valve and orifice tube. Learn how to service, diagnose, and repair heating, ventilation, and air-conditioning problems.